Kat's Rat Mats is back! Some of you may remember me, and some of you may not. A while back, life unfortunately smacked me over the head, and I had to take a step back. This meant having to close my doors and stop offering my hammocks for sale. I was very sad when this happened, as making hammocks and various toys for our little rat community meant a lot to me, and seeing so many happy pets (and their people!) made my day in so many ways. I've missed that experience every day, and decided that I needed to reopen and have that joy in my life again. I'm very happy to announce that Kat's Rat Mats is recently reopened and is on Etsy! I won't be doing custom orders or cage liners for the time being, but I will be slowly adding in my original designs, which include such favorites as the Spheroid, Corner Pocket, and Snoozit! I've only just opened, so there isn't a whole lot in the shop at present, but I promise that will change very soon. If there are any designs that you and your furkids have missed terribly, let me know and I'll make sure to get them up there pronto. Hope to hear from some of you soon! Re: Kat's Rat Mats is back! I'm having a shop wide sale on Etsy! Enjoy 10-20% off all items from 2/15-2/22! 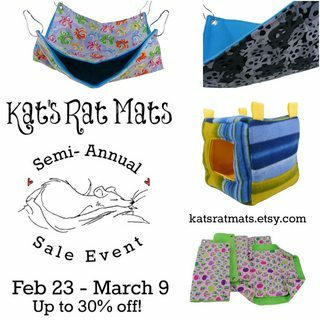 Also make sure to check out my Instagram (@katsratmats) and Facebook to stay up to date on new listings, sales, and promos. Spring is ON!! 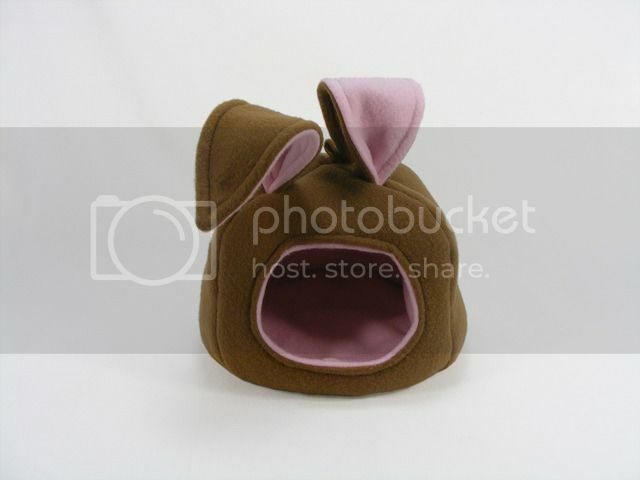 Introducing the brand new Bunny Ear Cuddle Cave! The same Cuddle Cave we've all come to love with a spiffy Spring upgrade! Find this and other Spring items in the shop. Introducing the Monster Edition of Kat's Rat Mats! Take a harrowing journey through the deep, dark places and see what lurks just around the corner! In the shadows creatures such as the infamous Great Blind Spineys, Eyeless BlobberyBits, and horrifying Grabby Gulpers skulk and stalk their unsuspecting prey. Only the brave may venture forth, and only the valiant will prevail! Do you, young fuzzy, have what it takes? Introducing the all new Monster Edition of some of your all time favorite hammocks and cage accessories! 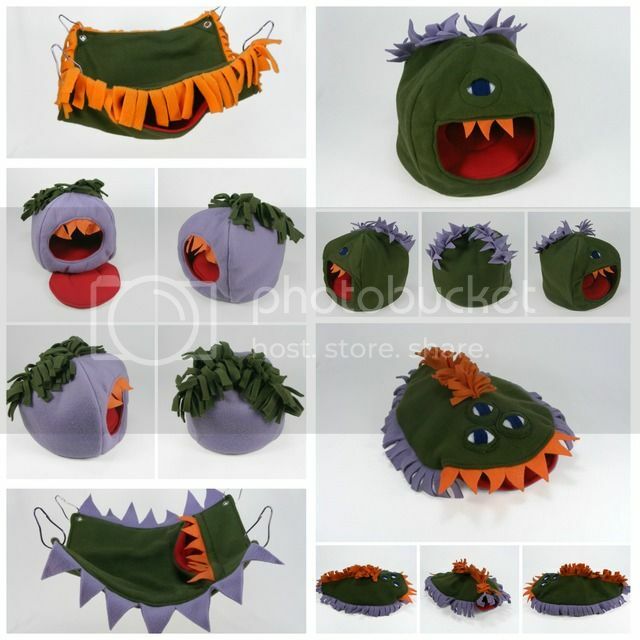 Each item is equipped with (fluffy) pointed scales, teeth, and tentacles, ready to munch on your carefree pocket pets. Where you see danger skulking, they'll only see loads of fun to be had! Everyone meet Klyg! 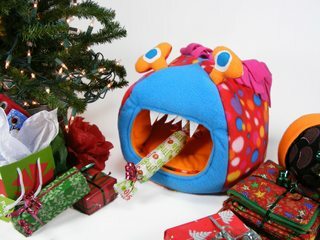 He doesn't mean to be naughty, but all those presents are just so darn tasty! Help him get on Santa's Good List this holiday season by giving him a loving home with your ratties. 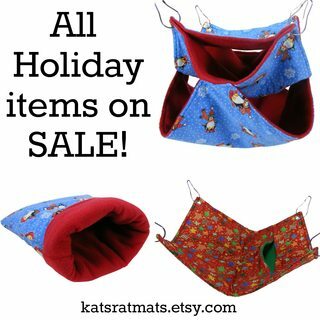 Find Klyg in the shop, along with lots of other terrific cozy gifts for your pampered pets. Christmas may be over, but the deals have just begun! From 12/27 to 1/5 all Holiday prints are on sale! My first Semi-Annual Sale Event is coming up soon! From February 23rd to March 9th find savings up to 30% off of all your favorite cozy cage accessories!